The stages each customer will pass through in a long-term relationship through acquisition, retention and extension. 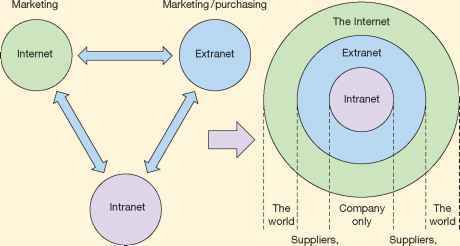 As was explained in Chapter 4 in the section on target marketing strategy and through Mini Case Study 4.2 on Euroffice, assessing and understanding the position of the customer in their relationship with an organisation is key to online marketing strategy. In this section we review methods of assessing the position of customers in the lifecycle and the use of 'sense and respond' communications to build customer loyalty at each stage of the customer lifecycle. 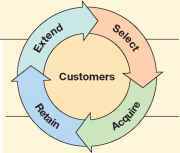 A high-level view of the classic customer lifecycle of select, acquire, retain, extend is shown in Figure 6.3. • What is their lifecycle? Customer selection 1 Customer selection means defining the types of customers that a company will market identifying key to. It means identifying different groups of customers for which to develop offerings and'OaTgetfng therrffor and to target during acquisition, retention and extension. Different ways of segmenting relationship building. customers by value and by their detailed lifecycle with the company are reviewed. acquisition tomers while minimising acquisition costs and targeting high value customers. strategiesand Service quality and selecting the right channels for different customers are important techniques used to gain at this stage and throughout the lifecycle. 3 Customer retention refers to the marketing activities taken by an organisation to keep its C.u.st°merJ®te"t.!o.n.. existing customers. Identifying relevant offerings based on their individual needs and Techniques to maintain detailed position in the customer lifecycle (e.g. number and value of purchases) is key. exis^ng^s^mere 4 Customer extension refers to increasing the depth or range of products that a customer purchases from a company. This is often referred to as 'customer development'. to increase their onrV¡oalnisationWith an (a) Re-sell. Selling similar products to existing customers - particularly important in some B2B contexts as rebuys or modified rebuys. (b) Cross-sell. Selling additional products which may be closely related to the original purchase, but not necessarily so. (c) Up-sell. A subset of cross-selling, but in this case, selling more expensive products. (d) Reactivation. Customers who have not purchased for some time, or have lapsed can be encouraged to purchase again. (e) Referrals. 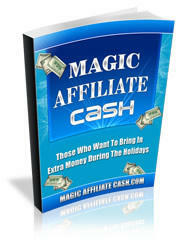 Generating sales from recommendations from existing customers. For example, member-get-member deals. You can see that this framework distinguishes between customer retention and customer extension. Retention involves keeping the most valuable customers by selecting relevant customers for retention, understanding their loyalty factors that keep them buying and then developing strategies that encourage loyalty and cement the relationship. Customer extension is about developing customers to try a broader range of products to convert the most growable customers into the most valuable customers. You will also see that there are common features to each area - balancing cost and quality of service through the channels used according to the anticipated value of customers. • Identification. It is necessary to learn the characteristics of customers in as much detail as possible to be able to conduct the dialogue. In a business-to-business context, this means understanding those involved in the buying decision. • Individualisation. Individualising means tailoring the company's approach to each customer, offering a benefit to the customer based on the identification of customer needs. The effort expended on each customer should be consistent with the value of that customer to the organisation. • Interaction. Continued dialogue is necessary to understand both the customer's needs and the customer's strategic value. The interactions need to be recorded to facilitate the learning relationship. • Integration. Integration of the relationship and knowledge of the customer must extend throughout all parts of the company.